Impunity presents itself in many forms – in the high-profile cases brought against former dictators, in the assassinations of activists and advocates for the disenfranchised, and in the abysmally low prosecution rates for violent crimes in Latin America’s more unstable regions. Because of this, LASC’s response has been varied as well. Since its inception, LASC has supported those opposed to oppression in all its forms, and in their incredible, arduous struggles to hold those responsible for some of the most egregious abuses to account. All too often, those who bravely oppose violence and injustice find their lives at risk. It is a sad fact that so many of our campaigns have involved lobbying for justice and supporting the families, friends, and communities of those who have lost their lives in this noble fight. In recent years, the disappearance of 43 students from Ayotzinapa, Mexico has become a rallying point and a symbol for all those opposed to Latin American impunity. In Ireland, LASC has taken a leading role in these protests, demonstrating outside the Mexican embassy, lobbying decision-makers in Ireland and abroad, raising awareness, and offering our support to the families of the disappeared. A particularly tragic moment for LASC was the loss of our compañera, Bety Cariño, who was killed, along with Finnish activist Jyri Jaakkola, when their humanitarian aid convoy was ambushed by state-supported paramilitaries while delivering food to besieged villagers in San Juan Copala, Mexico. 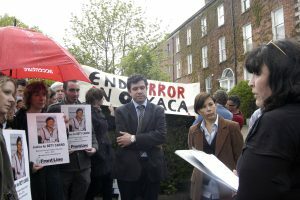 LASC set into action immediately, alerting Irish media, holding two vigils outside the Mexican embassy, lobbying the Mexican ambassador directly, supporting the families of both Bety and Jyri, holding fundraising events, and delivering a petition to the Mexican embassy. LASC’s vigil for our fallen compañera, Bety Cariño. Photo by Inaki Irigoien. LASC strongly condemns these barbaric killings, and the inaction of state authorities, and continues to mourn the loss of these courageous individuals. Although the struggle for justice is a long and arduous one, it is one that we must make. The mere fact that so many people in so many different countries are united against impunity sends the strongest message that nobody should be above the law.